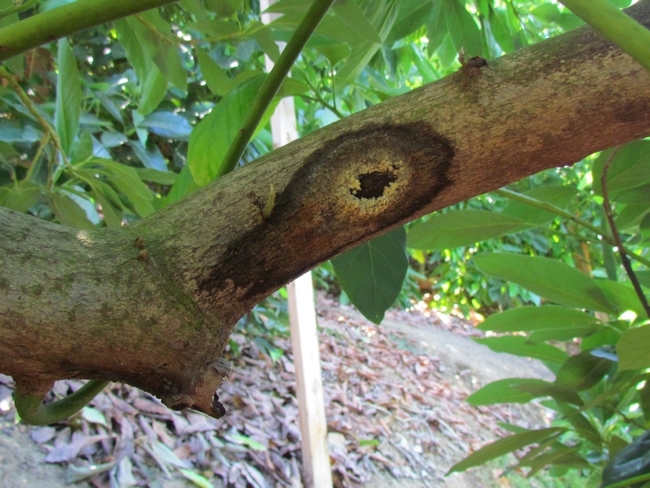 The polyphagous shot hole borer (PSHB) is an invasive ambrosia bee-tle that forms a symbiosis with a new, Fusarium sp., together causing Fusarium dieback on avocado and other host plants in California and Israel. 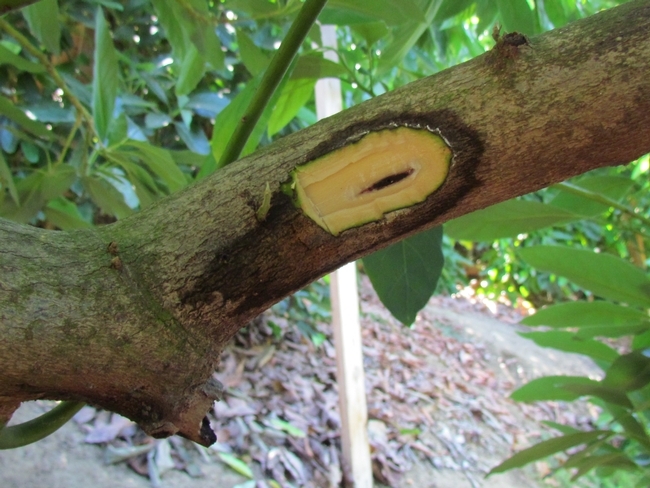 In California, PSHB was first reported on black locust in 2003 but there were no records of fungal damage until 2012, when a Fusarium sp.was recovered from the tissues of several backyard avocado trees infested with PSHB in Los Angeles County. The aim of this study was to determine the plant host range of the beetle–fungus complex in two heavily infested botanical gardens in Los Angeles County. Of the 335 tree species observed, 207 (62%), representing 58 plant families, showed signs and symptoms consistent with attack by PSHB. The Fusarium sp. was recovered from 54% of the plant species attacked by PSHB, indicated by the presence of the Fusarium sp. at least at the site of the entry hole. Trees attacked by PSHB included 11 species of California natives, 13 agriculturally important species, and many common street trees. Survey results also revealed 19 tree species that function as reproductive hosts for PSHB., approximately a quarter of all tree individuals planted along the streets of southern California belong to a species classified as a reproductive host. These data suggest the beetle–disease complex potentially may establish in a variety of plant communities locally and worldwide. The Polyphagous Shot Hole Borer (PSHB), Euwallacea sp. #1, is an invasive beetle that carries three fungi: Fusarium euwallaceae, Graphium sp. , and Acremonium sp. The adult female tunnels galleries into a wide variety of host trees, where it lays its eggs and grows the fungi. The fungi cause the Fusarium Dieback (FD) disease, which interrupts the transport of water and nutrients in over 35 tree species that are suitable for beetle reproduction. Once the beetle/fungal complex has killed the host tree, pregnant females fly in search of a new host. 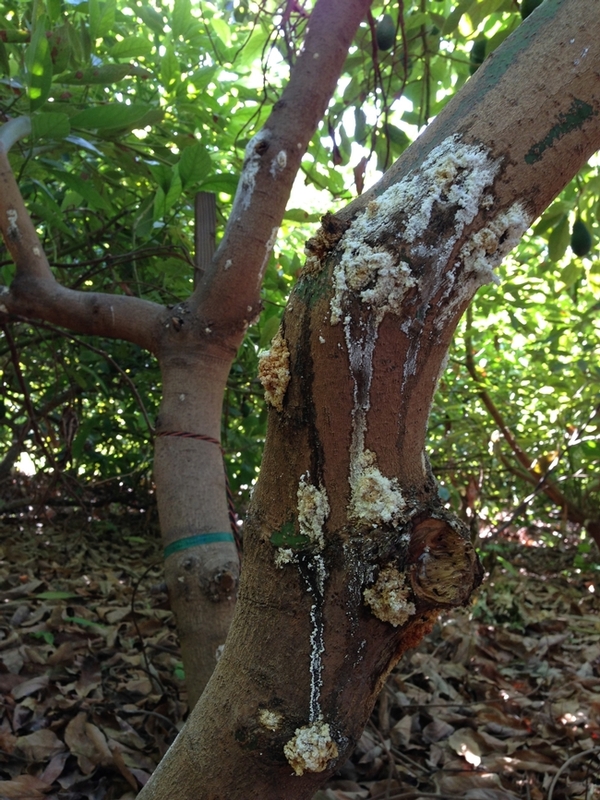 A separate invasion was recently detected in commercial avocado groves and landscape trees in San Diego county. It has been determined that the damage has been caused by another closely related species of PSHB (Euwallacea sp. #2), carrying a new species of Fusarium and Graphium. The beetle in LA, Orange, Riverside, and San Bernardino Counties are morphologically indistinguishable, but genetically distinct from the beetle found in San Diego County. 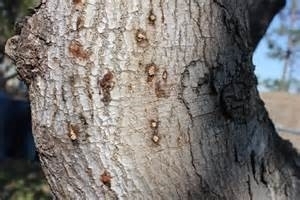 Attack symptoms, a host tree's visible response to stress, vary among host species. Staining, sugary exudate (B), gumming, and/or frass may be noticeable before the tiny beetles (females are typically 1.8-2.5 mm long). Beneath or near these symptoms, you may also see the beetle's entry/exit holes, which are ~0.85 mm in diameter. The abdomen of the female beetle can sometimes be seen sticking out of the hole. PSHB attacks hundreds of tree species, but it can only successfully lay its eggs and/or grow the fungi in certain hosts. 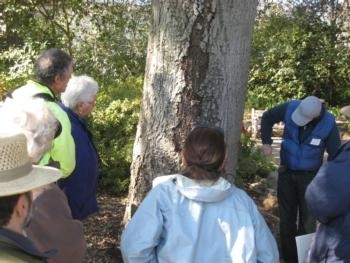 These include: Avocado, Box elder, California sycamore, Coast live oak, White alder, Japanese maple, and Red willow. Visit eskalenlab.ucr.edu for the full list. 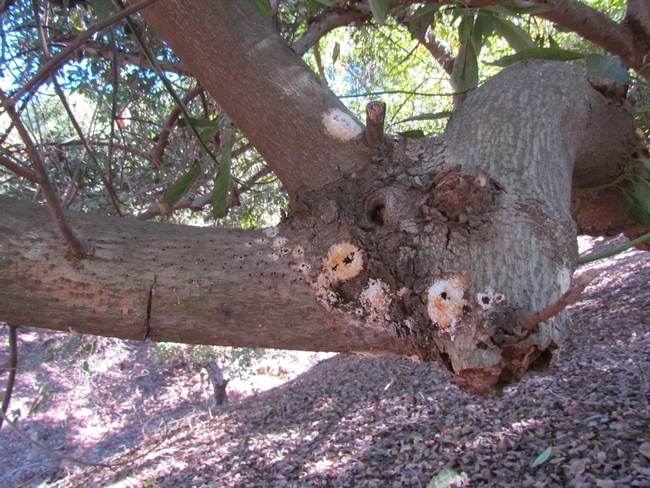 Please report suspected tree infestations to UC Riverside (eskalenlab@gmail.com). 3. the entry/exit hole, if visible, with a ballpoint pen for scale (remove exudate if necessary). If dieback is observed, take a picture of the entire tree.